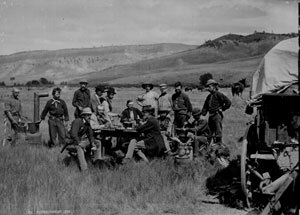 We have gathered a collection of some of the best and most interesting photos taken during the American frontier days. They are from the National Archives in Washington D.C. Please browse at your leisure. Meditate on the humble beginnings of the United States of America. 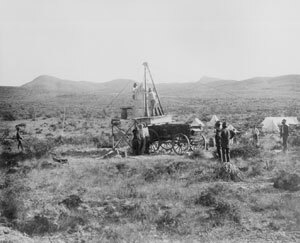 A member of Clarence King's Geological Exploration of the 40th Parallel is surveying from a rock. Shoshone Canyon and Falls, Idaho Territory, in background. By O'Sullivan, 1868. 77-KS-4412. 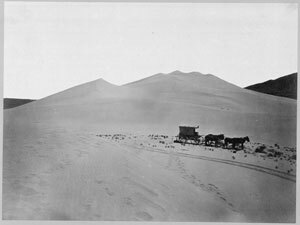 Timothy O'Sullivan's ambulance wagon and portable darkroom used during the King Survey rolls across the sand dunes of Carson Desert, Nev. By O'Sullivan, 1867. 77-KS-346O. A noon meal in Ferdinand V. Hayden's camp of the U.& Geological Survey. Red Buttes, Wyoming Territory, August 24, 1870. Hayden sits at far end of table in dark jacket; W. H. Jackson stands at far right. By Jackson. 57-HS-282. 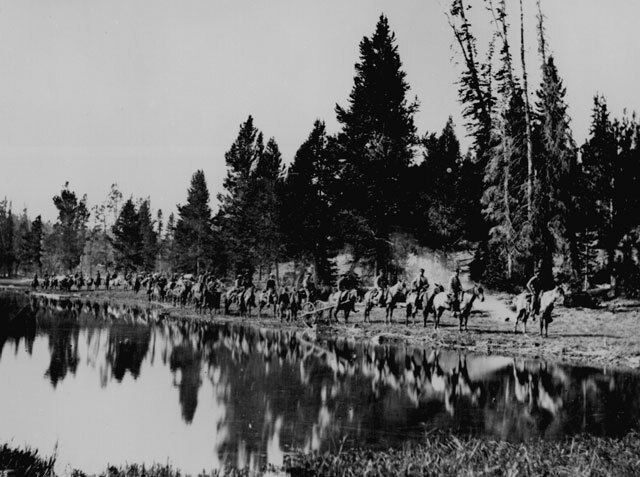 The U.S. Geological and Geophysical Survey of the Territories, conducted by Hayden, en route with pack train upon the trail between the Yellowstone and East Fork Rivers "showing the manner in which all parties traverse these wilds." 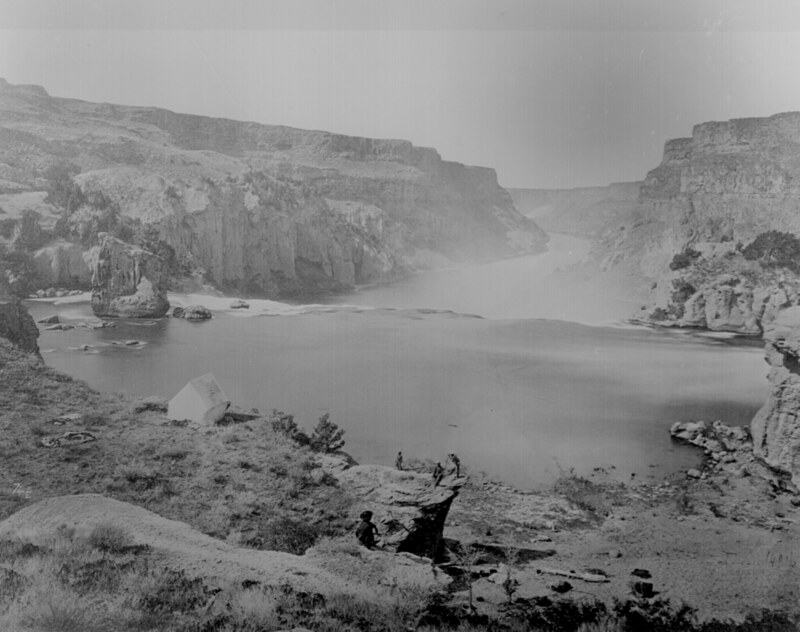 Wyoming Territory By Jackson, 1871. 57-HS-414. First camp of the John Wesley Powell expedition, in the willows, Green River, Wyoming Territory By E. 0. 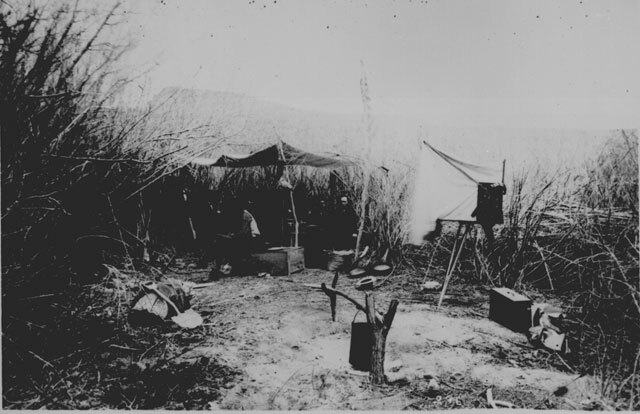 Beaman, 1871. 57-PS-471. An overland caravan laden with boats. Robert B. Stanton's Denver, Colorado Canyon, and Pacific Railway Survey, 1889-90. 57-RS-97. "Rebuilding Monument 40." By D. H. Payne, under the direction of the U.S. section of the International Boundary Commission, along the Mexican border west of the Rio Grande, 1892--94. 77-MB-442D. The American frontier makes up the geography, history, folklore, and cultural expression of life in the forward wave of American westward expansion from the original colonial settlements to the early 20th century. Enormous popular attention focuses on the second half of the 19th century, a period sometimes called the Old West, or the Wild West. As defined by Hine and Faragher, "frontier history tells the story of the creation and defense of communities, the use of the land, the development of markets, and the formation of states." They continue, "It is a tale of conquest, but also one of survival, persistence, and the merging of peoples and cultures that gave birth and continuing life to America." Through treaties with foreign nations and native tribes, political compromise, military conquest, establishment of law and order, building farms, ranches and towns, marking trails and digging mines, and allowing in great migrations of foreigners, the United States expanded from coast to coast fulfilling the dreams of Manifest destiny. As the American frontier passed into history, the myths of the west in fiction and film took hold in the imagination of Americans and foreigners alike. America is exceptional in choosing its iconic self-image. "No other nation," says David Murdoch, "has taken a time and place from its past and produced a construct of the imagination equal to America's creation of the West." 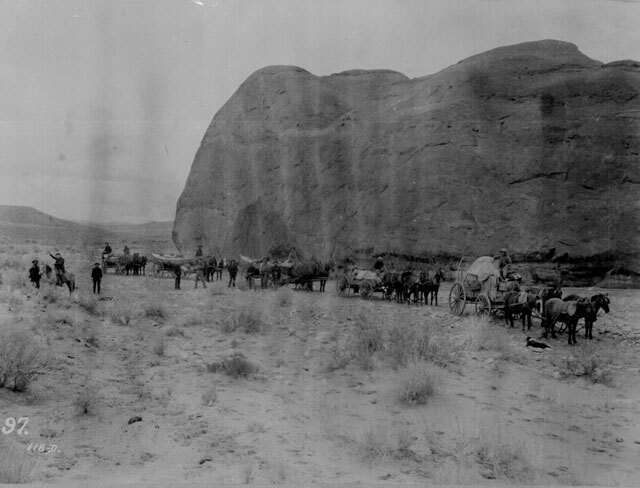 Links to More Photos of the American West from the National Archives databases.